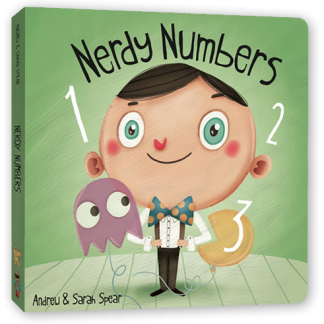 We’ve developed different back-stories for the new books: Nerdy Numbers is set at a birthday party and Sci-Fi Shapes is all about an imaginary astronaut adventure. I believe it’s important to make learning meaningful. Like any parent does every day – counting the objects, or identifying shapes around them. Our youngest (2) went through a phase of identifying the triangles wherever she was. That’s what we want for our numbers and shapes, that children will start identifying the number 42 or a twin helix when they see one. I mean truly – how cool would that be! Every child enjoys a birthday party and it’s our fun to think of as many tech items we can and people we can nod to that we can make relate to a birthday party. 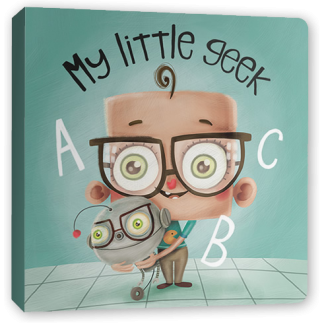 Our mini-techie is very clever, so what he can imagine, invent and build is going to be pretty amazing. 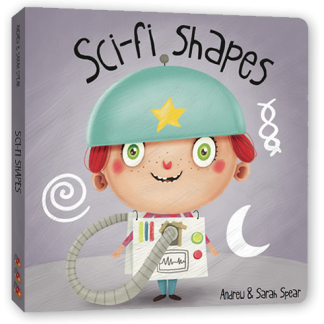 In our Sci-Fi shapes book, although he is young he is creative with objects around him and with a friend we will go on an amazing journey into space. The themes we create compliment the corresponding iPad app games we are working on too.